Back in June I went on an affordability bent and concluded that based on the idea of an affordability cycle, our peak to trough correction in real dollars might be relatively mild at 15%. Of course there a many factors not accounted for which might distort the picture over time (such as a change in levels of unreported income which would make affordability look worse than it is, or the increased debt load of Canadians, which would make it look better). These things are tough to take into account, so I figured I'd revisit the issue and try to improve the model in other ways. First I took out the variable amortization again, as the data was just too sketchy. This keeps the comparison consistent across the range, with the only variables being income, house prices, and interest rates. 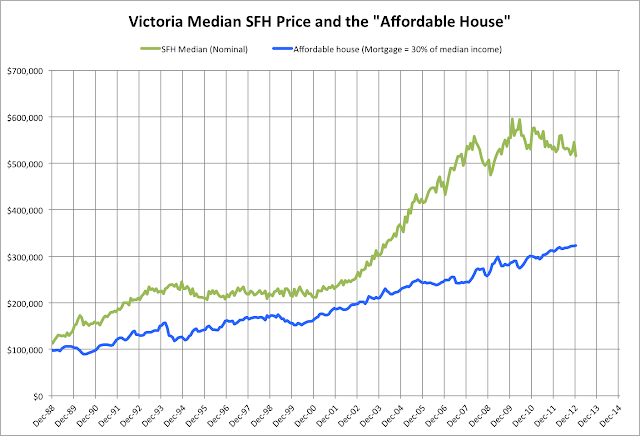 As we know average prices are more easily distorted by outliers, so I switched to the median SFH price (which only goes back to 1988, but on the plus side it is monthly data) and median incomes. Interest rates is the StatCan table V122497, "Average Residential Mortgage Lending Rate: 5 year". Last time I used the household income for all families. This perhaps unfairly boosts mortgage payments relative to income, since it includes unattached individuals that are not likely to be buying houses. So this time I used data for economic families only (economic family refers to a group of two or more persons who live in the same dwelling and are related to each other by blood, marriage, common-law or adoption). With an ownership rate of 70%, I think we can be fairly confident in saying that these kinds of families are buying single family homes in Victoria. Long story short: Does the picture look any different? Mortgage payments are now operating in a more realistic range. The generally accepted threshold for affordability is 30% of your income. Mortgage payments relative to income are still significantly above the levels of the 90s at this point, even with our incredibly low interest rates. So far the improvement in affordability since about 2008 has come primarily from dropping interest rates, increasing incomes, and inflation. That scenario would mean another 10% nominal decline from here, for a total nominal decline from peak of about 22%. And that prediction is worth exactly what you paid for it. Update: Info points out that using economic families is discarding a large number of potential buyers and distorts the affordability picture. Fair enough, it seems it is more common to use the overall median, so let's add a chart for that. I don't think it's a good idea to get hung up about the exact value of the measure though. There are several reasons why it might appear elevated in Victoria. More importantly I think is where we have been in our last slump, which gives us an indication of what can happen in Victoria. Using the overall median shifts the measure up, but doesn't change my conclusion. The thing that jumps out for me is that if you look at the graph, in the twenty-two years, the median price has been above 30% of income almost 2/3 of the time. The last time that the 30% mark was hit was ten years ago. Maybe 30% is not the right benchmark for Victoria? Maybe that is a national average? I think non-mortgage household debt, which we all know is at historic highs, will subtract from the ability to take on and service mortgage debt for a given income and lead to a lower floor than in previous decades. I'm not expecting a really big difference in nominal decline from you prediction, just high 20's versus low 20's. Thanks again for another set of great graphs. The last time that the 30% mark was hit was ten years ago. Maybe 30% is not the right benchmark for Victoria? I agree. I don't have a solid explanation for why it doesn't hold in Victoria, but it clearly doesn't. This time I used "economic" families, but that is not common. For example, take a look at Seattle. They fit the 30% model quite well, and they are using median income for all families (which is almost $20,000 less than our current "economic family" income. My theory is that because Victoria is a retirement destination, lots of income is brought, not earned here. I think the exact values are not really important. It seems the low for Victoria is around ~30%, rather than the high. Yes. We might be able to get more insight by looking for a source of data on disposable income and seeing how it has changed. I don't think we are going to see a return to 30% in Victoria, unless briefly as a result of a spike in interest rates and huge price drop. House prices seem to have risen above this ratio fairly steadily. When we look at 1950, a home was twice the average salary. Now this number is much higher and has been for my house-buying lifetime. As far as why Victoria is different, not exactly sure either but desirability might be a part of it. Local markets don't tie-in to national averages well sometimes. I suppose this means we spend less on some other stuff. Price/income is different. It will rise because of lower rates over time (until now of course). Also in 1950 Victoria looked quite different so I would put more weight on recent values. I would also put more weight on more recent data. I also agree price/income is different - I just don't have affordability data for 1950. I expect housing was much much more affordable across the board on most measures - I don't know what financing was like. Victoria has changed a lot over the last sixty years. Local markets don't tie-in to national averages well sometimes. 30% is not a national average. It is an accepted threshold of affordability. There is a reason that CMHC puts the limit of the Gross Debt Service Ratio at 32%. GDS is your home related expenses over your gross income. 32% includes things like maintenance and taxes, so 30% is a sensible level for just the mortgage. Of course this is for _individual_ purchases. The median is only for historical comparison. A side-bar comment on listing #318628 - 1410 Myrtle Avenue. Listing price: $468,500. 2013 assessment: $469,200. Listing reads: Priced Below 2013 Assessment ! Wonderful Opportunity ! Are you friggin kidding me???? $700 is a rounding error. Let's get real. They must think house buyers are morons. Yes. I don't know what to say about the accepted threshold for affordability except that it has moved from 25% to 30% in Canada. Not sure that it cannot move further. Totoro (aka Toto) said: Victoria has changed a lot over the last sixty years. A couple of stats to toss into the mix when thinking about the graphs. It's already been mentioned that 'income' is a tricky measure when this is a retirement destination. GVA = 18.4% of total population in comparison to provincial of 15.7% and national of 14.8%. The other side to balance this with is low income seniors: GVA: 11.3%, provincial: 15.5% and national 13.5%. So nearly a fifth of the population of Victoria is on fixed income (probably higher because people retire on avg at age 62 in Canada). On the other hand, higher income seniors come here and therefore the poverty rate is lower. "Victoria has changed a lot over the last sixty years"
Yes - Fairfield homes have gone from just old to heritage! Not sure that it cannot move further. The fact that CMHC enforces a 32% GDS means it cannot move for first time buyers. You mean high ratio mortgage holders? The relevant piece being that 60% of buyers 18-34 put down less than 20% (and thus are bound to CMHC rules). That includes all buyers, not just first timers. Back in the 1950's couples with children were practically forced to buy a house. There were very few rentals. There were no condos. Most rentals did not allow children. One person worked outside the home. Very difficult to compare the 50's with now. Victoria didn't get its first condominium until the early 70's and apartment blocks for the most part ceased to be built at that time. It was typical of young married couples up until the late 60s to rent a furnished apartment. They would save their money for a down payment and usually buy in when "they" got pregnant with their first child. A war time house in James Bay or Esquimalt could be purchased for approximately $5,000 in the mid 60's and a bungalow for about $11,000. I remember my dad's income around 1960 was about $400 per month....or $4800 a year. Lots of new listings showing up on my two PCS accounts over the past few days. I'm surprised by the surge in listings in the > $600K range. Perhaps the spring sales season is starting early? Most overpriced new listing of the day? Asking $459,900; assessed: $388,100. But wait, the basement is a full 6'9"! Much of the same, once again. You have tried this before. You make far too many assumptions for this to be valid in any way. You cannot, for example, remove a significant portion of the population, namely unattached individuals, because you assume they will not be buying real estate. That is nonsense. Removing this portion of the population results in better affordability numbers. I disagree with some of your other assumptions as well. You emphasize income gains far too much. In fact, you try to give gains in income the same weight as the effects of emergency level interest rates. That's absolutely absurd. Basically, any perceived "affordability" that the market offers at the current time is due, almost entirely, to temporary emergency level interest rates. Rates will be rising in the future. Buying a property because rates are historically low at a time when house prices are at extreme bubble prices is never a good idea. Your attempt to justify "affordability" based on anything but emergency level interest rates is misleading, at best. To suggest incomes have boosted affordability in any way comparable to the dropping of interest rates to emergency levels since 2008, is inaccurate and misleading. 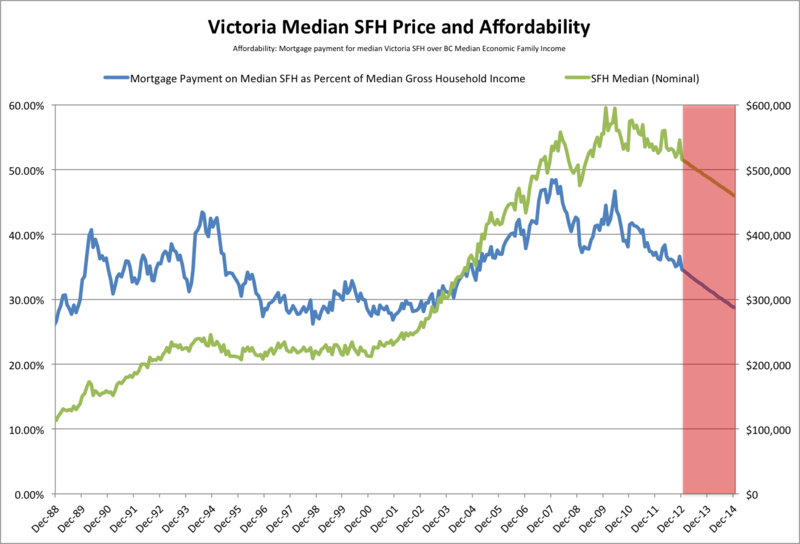 You completely forgot to take into account that house prices in Victoria are not at all supported by incomes. 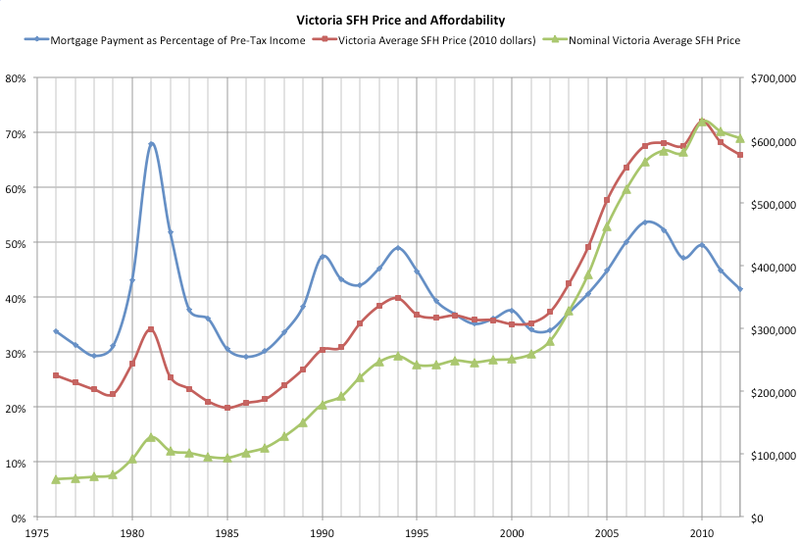 Victoria has a price/income ratio of about 8.2, which proves that incomes do not support prices in any way. Victoria's housing market is rated as extremely unaffordable. Obviously other factors have been present in the housing market for the past number of years, such as all the stimulus which caused excess credit which led to increased affordability and higher prices. Much of this stimulus has been removed from the housing market recently, as we have seen, with the tightening of the mortgage rules. You ignored this as well. Then you proceed to conclude that Victoria's price correction will be, well, minor. 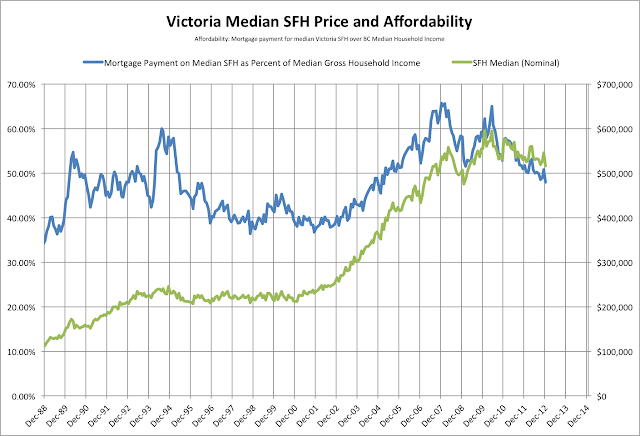 Once again, completely ignoring price/income ratio which is screaming that current house prices are not at all supported by incomes in Victoria. Victoria is part of Canada. We have a national housing bubble in Canada right now. Over the past 40 years, 48 different national housing bubbles have been analyzed. Once they reach peak, they always correct back the same amount. It happened in the US recently, in the UK, Norway, Japan, etc. The US is a useful example to look at. Cities that experienced the biggest price gains genrally lost the most in the correction. Miami, Los Angeles, Las Vegas and Phoenix are some of the best examples. In Canada, Vancouver and Victoria experienced gains as big or bigger than these US cities. Vancouver and Victoria will likely experience the biggest price corrections in Canada. You have stated that you will be buying within a year no matter what happens in the market. It seems you are attempting to convince yourself that Victoria's housing market is affordable because you will be buying soon. Victoria's housing market will not bottom out in a year's time. It is entirely possible that most of the price declines will happen after 2013. Rates will be rising in the future. and by the time rates rise I'll likely have enough to pay off the mortgage. Not too concerned. You make far too many assumptions for this to be valid in any way. I'm well aware the assumptions may not hold. You cannot, for example, remove a significant portion of the population, namely unattached individuals, because you assume they will not be buying real estate. 1. I didn't say they aren't buying real estate, I said they are unlikely to be buying detached single family homes. Much more likely that they are buying condos. 2. It doesn't matter whether we include them or not. If I use the overall median the conclusion is the same, but the values are higher. I will make you a graph with the overall median to demonstrate sometime. I disagree with some of your other assumptions as well. Please elaborate and maybe we can fix it. You emphasize income gains far too much. In fact, you try to give gains in income the same weight as the effects of emergency level interest rates. That's absolutely absurd. ... To suggest incomes have boosted affordability in any way comparable to the dropping of interest rates to emergency levels since 2008, is inaccurate and misleading. Actually I said no such thing. I said: "So far the improvement in affordability since about 2008 has come primarily from dropping interest rates, increasing incomes, and inflation." This is a fact. Nowhere does it say that the magnitude of each factor's effect on affordability is equal. That is from your own misreading. You completely forgot to take into account that house prices in Victoria are not at all supported by incomes. You completely forgot how mortgages work, and that like you say, the interest rates are just as big of a factor as price when calculating total cost. I agree that if interest rates go up, the whole house of cards falls down. However I see pretty much zero chance of that happening for a couple years. As the housing market starts to decline across Canada, the pressure on rates to rise will be reduced even more. I'm not about to bank a prediction on rising rates, hence the emphasis on affordability. Yes price/income is huge, but that doesn't matter as much if rates stay low. I certainly agree that as rates _do_ slowly recover, real estate may be flat for a decade or two and people expecting another boom in 3-5 years will be surprised. Yes that's the current plan. That's not to say we can't re-evaluate the situation at that time, but right now I can't think of a situation that would cause us to hold off. There are other factors at play that makes it a sensible time to buy for us. If prices drop, then we get a place for cheaper and we will be closer to the bottom. Given I predict another 10% from here, any significant drop will get us halfway there, and I'm ok with not getting the exact bottom (would rather buy on the way down than the way up). If prices don't drop, then I don't think there is any sound argument left that they still will (but I don't think this will happen). The 15-year-old gets schooled by the GraphMaster! "You have tried this before"
Bad Leo! Presenting graphs and opinions. How dare you! Yep - tmi - too much info-style info. We can't predict next year. Just because you are convinced you have a crystal ball does not mean you are correct. There are several versions of the future on here. Info: see updated chart at the end. As a point of reference, the median gross household income in BC in 2010 was $52,800, while the median income for economic families was $73,200. Also in 1950 Victoria looked quite different so I would put more weight on recent values. I think what it all comes down to is, are we experiencing the regular ~10up7down, or are we due for a secular ~20 down (~60up20down). I believe a perfect storm is coming in the housing market. Canada will experience significant “secular,” or long-term, decline in house prices starting around 2015, when the population ratio is about to turn upward based on Statistics Canada projections. Excellent charts Leo and I like your theory because Victoria is a retirement destination, lots of income is brought, not earned here. This may shift somewhat, as retirees now have much cheaper choices of destination. I cannot ever recall this much of a price difference between coastal BC and the sunbelt. I actually used BC Median family income rather than Victoria CMA. The Victoria CMA income data quality is not very good because it is based on a small sample. However I'm not sure where they got $77,820 for Victoria's family median. 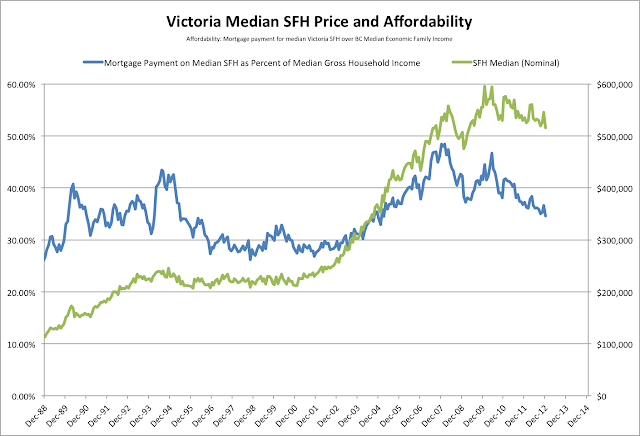 It's definitely true that affordability is and has been worse in Victoria than many other perfectly nice cities. I'm not sure what would cause that to change, but if it did, it would cause a much larger decline to get down to the levels normally deemed "affordable". I updated the article with another graph showing what a house would cost at 30% of gross income. "Actually I said no such thing. I said: "So far the improvement in affordability since about 2008 has come primarily from dropping interest rates, increasing incomes, and inflation." This is a fact. Nowhere does it say that the magnitude of each factor's effect on affordability is equal. That is from your own misreading." You chose to not point out the obvious - that the effect of dropping interest rates to emergency levels has had, by far, the most significant impact on affordability since 2008. "You completely forgot how mortgages work, and that like you say, the interest rates are just as big of a factor as price when calculating total cost." Interest rates that will be rising soon. You should have stated that in your post. The public should be aware of the dangers of buying with temporary, emergency interest rates that have only one way in which to travel. So what you're saying is that it is plainly obvious, and yet still needs to be pointed out. Ok I'll leave that to you. Interest rates that will be rising soon. You should have stated that in your post. Except no one knows what interest rates will do. At best you can say they may be rising soon. They may also stay the same. No one knows, and I think there are quite a few indications that they will stay low for quite a while to come. The public should be aware of the dangers of buying with temporary, emergency interest rates that have only one way in which to travel. I'm not here to warn the public about anything. In fact I couldn't care less about what the public does. I'm just interested in what I should do, and if I'm looking at the data anyway I might as well put it on the blog. "I certainly agree that as rates _do_ slowly recover, real estate may be flat for a decade or two and people expecting another boom in 3-5 years will be surprised." At least you are not completely bullish. However, flat rates for two decades (will not happen) will not stop the major housing market correction already happening in Canada. Afterall, the US slashed rates from 5-6% down to 2-3% in the middle of their crash and their market continued to crash for another 2-3 years. Continued emergency rates in Canada cannot stop a major correction from bubble prices that have their roots in 13 years of stimulus policy. Now that much of this stimulus has been removed, prices across Canada will melt for years. "Given I predict another 10% from here"
More research into the amount of stimulus thrown at the Canadian housing market over the past 13 years might make you see how much of a price bubble Victoria is in. Victoria's house prices more than doubled over the last decade due to government policy - an outside force. You tend to keep the blinders on and ignore this. Victoria's market saw major price increases at the same time and for the same reasons as all other major Canadian cities. It is only logical to conclude that Victoria will experience price drops for the same reasons that other major Canadian cities will - nameley that all bubbles burst and correct significantly when prices have increased much faster than incomes for an extended period of time. As well, all Canadian cities will experience significant price drops because of the removal of the stimulus that fueled higher house prices over the past 13 years. Your assumption that Victoria will see only a 10% correction from here is ridiculous. That wouldn't even begin to bring the current, extremely overvalued price/income ratio of 8.2 back to any sort of sustainable level. Take a look at what happened in the US. Cities that had comparable bubbles to Victoria, such as Miami, Phoenix, Los Angeles and Las Vegas all experienced major corrections that brought their price/income ratios back to sustainable levels. The correction in Victoria will be complete when prices drop enough to allow incomes to support them. The degree of correction will be accented by the recent removal of much of the housing market stimulus that had been in place for many years. I'm not saying that Victoria will necessarily correct back to a 3.0 price/income ratio - that may or may not happen. "Except no one knows what interest rates will do. At best you can say they may be rising soon. They may also stay the same. No one knows, and I think there are quite a few indications that they will stay low for quite a while to come." I think that a warning about the dangers of buying at extremely high prices and extremely low rates is warranted. I have not seen any warning of this sort from you. Your whole post assumes that rates will stay at emergency levels for a long period of time. What message is that giving to the public? Info, you need to research what happened in the states and why it's crash was so severe. We are not in the same scenario here. Rates could stay low for a decade and prices could remain relatively flat over the same period. Meanwhile wages climb and affordability is obtained again...however breifly. Leo you are calling for the market to bottom out in a year based on the assumption that interest rates will remain at emergency levels for many more years. You are ignoring the removal of most of the stimulus that caused house prices to rise to bubble levels over the past 13 years. You are ignoring the fact that incomes do not even come close to providing any support for current prices. You are ignoring all of the key factors that determine future house prices that have been proven to work in every major housing bubble in the history of the world, be it local or national. Open your eyes and realize that Canada has started a major, multi-year correction. In the US, cities that started their corrections early formed bottoms at the same time that the US market in general formed a bottom. Victoria does not stand alone. It will follow the rest of Canada in its correction from now until the bottom. Why haven't prices tanked in the last 8 years given lack of affordability. A few days ago I listed a nice townhome on Cedar Hill Cross for $385,000. In 2005 it was worth around $340,000; therefore, one could argue that it is just as affordable (or unaffordable) now as it was 8 years ago due to lower interest rates. Is it normal for market to be unaffordable for nearly a decade and then to tank? My opinion, but whoever paid 340k for that in '05 overpaid. A dated townhouse like that, in that location will be around 250k by the time the correction is over. It's simply far cheaper to rent it than own it. And it's the investor who will eventually put a floor under that type of property once it makes sense. Victoria's house prices more than doubled over the last decade due to government policy - an outside force. From 2000 to 2010, real prices in Victoria increased by 104%. From 1985 to 1994, real prices in Victoria increased by 101%. Why didn't Victoria prices crash after 1994? You tend to keep the blinders on and ignore this. Actually I started there. I made a graph like this several years ago and concluded that Victoria was in for a crash of 30-40%. Then I learned more (like that a linear trend line doesn't make any sense at all) and shifted what I think is the most reliable model. 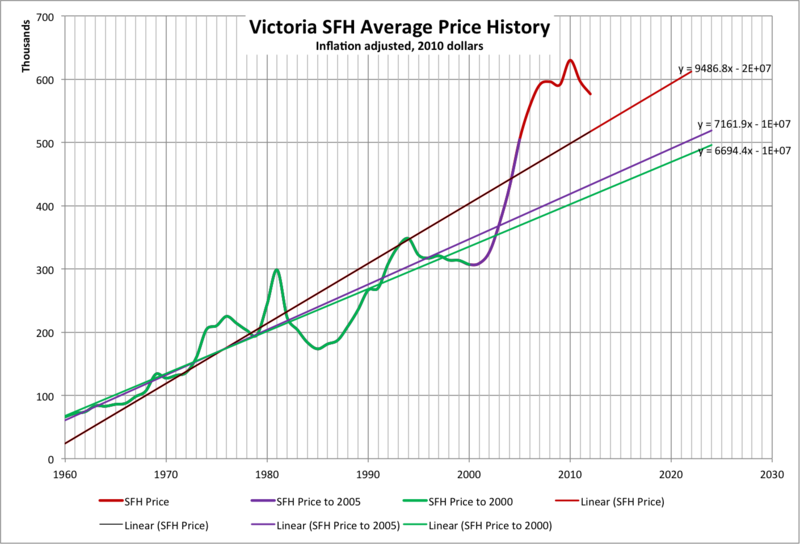 It is only logical to conclude that Victoria will experience price drops for the same reasons that other major Canadian cities will - nameley that all bubbles burst and correct significantly when prices have increased much faster than incomes for an extended period of time. Except in the 90s, when the same thing happened and it just stagnated for a long time. When you see an example that doesn't fit your model, you should try to find an explanation rather than ignore it. My explanation is that the cycle is in affordability, not home prices. To me the data supports that, although of course it's tough to form any really solid conclusions when the cycles are so long, and cover so much change in Victoria. Ok, so let's say it corrects back to a (average price/average household income) ratio of 4.0. That would mean that the Victoria average would be about $300,000). If interest rates don't increase, that means the average family would be spending only 21% of their income on a mortgage, which is 50% less than any time in the last ~35 years. I just don't see it. That's not to say it can't happen, but it will take a new event, like a wave of foreclosures or massive unemployment. You seem to be mistaking me for some sort of public educator. I don't care what anyone else does (but it's ok, I still love you all). I am? I think you better take another look at graph 3. The bottom is at least 2 years off, and will probably undulate around there for several more. You are ignoring the fact that incomes do not even come close to providing any support for current prices. If prices decline another 10% or so, they will be supported by incomes at these interest rates. More correctly, they would be supported by today's incomes at these interest rates. If RE declines in a RE-based economy, what happens? Good point patriotz. Of all the assumptions, I think the one that incomes will pace inflation is the shakiest. They could very well decline going forward. The public sector and the university are both facing cuts, hiring freezes, and layoffs. The promised shipbuilding jobs are looking to be fewer and further off than anticipated, and BC ferries isn't exactly looking rosy either. Tech is doing ok, but the big employers are not. Further declines may come as jobs in construction and real estate are lost during the melt. IMO The other factor when comparing across time periods is the consideration of how generational behaviour changed. By 1985 the baby boomer females were moving deeper into the job market, earning increasingly good wages along with benefits. The opportunity to purchase more expensive housing was greater than any other generation. It was a factor for this type of increasing price. By 2000 there is still move-up-market activity but the effect of women has been baked into the data. Now it's more a factor of government policy. Perhaps, but between 1985 and 1994, real average household income in BC increased by only $700, or less than 0.1% per year. The biggest increase actually came in concert with the latest housing boom. From 2000 to 2010, real incomes increased by 14%, from $61,600 to $70,200. IMO The other factor when comparing across time periods is the consideration of how generational behaviour changed. What about the impact of suites this time around? these charts tell a different story. I think we don't know enough about suites. Has the percentage of houses with suites increased since the 90s? If so how much? What percentage of suite rental income is undeclared? If it is declared it would already be captured in the household income figures. Declared income for a suite would be net of expenses including mortgage interest, and would be very small or negative for a lot of recent buyers. So the rental revenue increases the house buying power without increasing the household income. I see how that applies to disposable income stats, but it should show in gross income, no? I wonder. They might be tabulating employment income only? I havn't done my own returns for over a decade. Is there even a Gross Income line including capital gains, dividends, rental, other, employment etc? They might be tabulating employment income only? I havn't done my own returns for over a decade. Is there even a Gross Income line including capital gains, dividends, rental, other, employment etc? I'm almost certain it includes everything. This source has market income which they define as "Market income consists of earnings, private pensions, income from investments and other sources." I don't understand how the other columns fit together though. The table I'm using cites "total income", which comes to $73,200. Not sure what other income is included there, but it seems it includes everything. There appears to be a correlation between ridiculous pricing and the age of the realtor. Older realtors are apparently not accepting the new normal of declining home prices. Ok found it. So, total income consists of market income + government transfers (benefits). So all rental income should be captured assuming it is declared. Rental income might be offset by lower taxes, but it should still show up. The other way to approach this is to use disposable income which will capture things like changes in taxation and gov't benefits over the years. I'll leave that for another article. "Seller will not accept any offers from employees of Toronto-Dominion Bank or any of its subsidiaries." I guess with such a desirable property you can be picky with who you sell to. I feel sorry for the realtor on that one..
"So the rental revenue increases the house buying power without increasing the household income." Correct. This means that they a share of your mortgage and expenses but it has no effect on your income because of the deductions for expenses attributable to the square footage rented out. The impact of a suite is shown on gross income but not on net income for recent buyers. Works out quite well. "The public should be aware of the dangers of buying with temporary, emergency interest rates that have only one way in which to travel." This might happen in the next couple years, or it might not. There are also ways to manage this like a ten year rate and aggressive pay-down schedule during prime income-earning years. And/or suite income potential. The impact of a suite is shown on gross income but not on net income for recent buyers. And the income that I'm using is gross income. So the impact of suites is already priced in to the affordability. On your income tax return the rental revenues and expenses are reported on T776 and the balance (positive or negative) is then entered on line 126 of page 2 on the T1 in calculating total income. Then various deductions are applied to arrive at net income, then some more to get taxable income. I think CRA stats are for taxable income.
. Is there even a Gross Income line including capital gains, dividends, rental, other, employment etc? No. Total income is calculated using net income from rentals and self employment. Why? It's a foreclosure which means a sale will eventually happen, which is more than you can say for a lot of other properties.. The bank is trying to avoid a conflict of interest with that notice. This includes interest received on bonds, deposits and savings certificates from Canadian or foreign sources, dividends received from Canadian and foreign corporate stocks, cash dividends received from insurance policies, net rental income from real estate and farms, interest received on loans and mortgages, regular income from an estate or trust fund and other investment income. Realized capital gains from the sale of assets are excluded. Negative amounts are accepted." Winning!..Scroll down a bit to the blue bars. It is truly whacky that we hold the world record by that much over Hong Kong and australia. I honestly think Vic has the highest in canada, so it stand to reason we probably hold the record of AnY cItY in the world!!! Sort of chiq at the same time! Info's quote...."The public should be aware of the dangers of buying with temporary, emergency interest rates that have only one way in which to travel." Can you explain what you mean by info-mercial because it seems to me to be a putdown. So unlike you. "info-mercial" was not said to be a put down but in jest as a play on words. sorry info :) it can easily be read as a put down - dangers of blogging where there is no other context.